The area included in the implementation of agri-environmental measures expanded markedly after 1999, covering 254,772 ha (gross) in 2014. 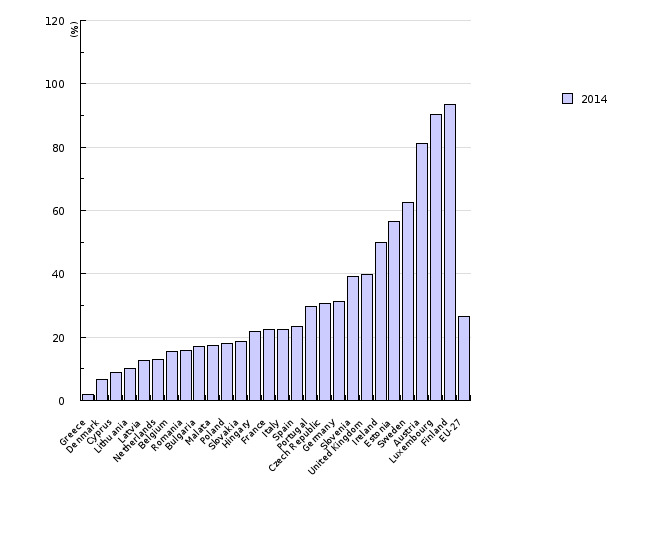 The proportion of the area with one or several agri-environmental measures (net area) to the total utilised agricultural area increased from 0.6% in 1999 to 39.2% in 2014. In 2015, agri-environmental measures started to be carried out in accordance with the new programme, on the gross area of 317,458 ha. This indicator presents the area included in the implementation of agri-environmental measures in Slovenia and the EU in the period 1999–2015. It shows the areas that obtained support for the implementation of individual environmental measures in line with regulations on the implementation of agricultural policy in a particular year. As several agri-environmental measures can be implemented on the same land, the base unit is gross land area. The relative aggregate indicator is the share of land area subject to these measures in the total utilised agricultural area. In calculating the relative indicator, data on net land area is used (without doubling those where several measures are being applied), which is comparable with the definition used for calculating the indicator within the EU. This indicator does not provide direct information on the environmental efficiency of measures. It does, however, show the response of agricultural holdings to agricultural policy supporting environmentally-friendly production methods. Ministry of Agriculture, Forestry and Food of the Republic of Slovenia, 2016; Statistical Office of the Republic of Slovenia, 2016. Note to table KM3-1: The new program is not directly comparable with the previous periods. European rural network, 2016; EUROSTAT, 2016; Ministry of Agriculture, Forestry and Food of the Republic of Slovenia, 2016; Statistical office of the Republic of Slovenia, 2016. By 2013, to implement agri-environmental measures on 365,000 hectares of utilised agricultural land (gross area), with at least one agri-environmental measure on 204,000 hectares (net area) (Rural Development Programme for the period 2007–2013). By 2020, to implement agri-environmental measures on 426,000 hectares of utilised agricultural land and organic farming on 55,000 hectares (in total, of 481,000 hectares of gross area) (Rural Development Programme for the period 2007–2013). The measures of agri-environmental programmes with various forms of support encourage the preservation or transition to more environmentally-friendly ways of production, thus improving the quality of soil and water, preserving the fertility of soil, biodiversity, the traditional rural landscape, and, consequently, sustainable use of natural sources. Farmers join the programme on a voluntary basis and implement the measures on part of or on their entire farm holding. By signing a special agreement, they undertake to run production within a minimum period of time (five years as a rule) in line with the conditions prescribed for individual measures requiring more than just respecting the usual principles of good agricultural practice. By joining the agri-environmental programme, they are entitled to direct payments to cover additional costs, or compensation for the loss of income due to more demanding farming methods. Agricultural policy supporting environmentally-friendly ways of production was first applied in 1999, and, to a larger extent, after the adoption of the Slovenian agri-environmental programme in 2001. In the first year (2001), ten measures were implemented, and in the years that followed, their number increased to more than 20. After joining the EU in 2004, support under the agri-environmental programme became part of the Rural Development Programme of the Republic of Slovenia (2004–2006, 2007–2013 and 2014–2020). Implementation of measures under the new programme began in 2015 and will be in place for the period until 2020. New agri-environment-climate payments follow similar goals as the measures in the preceding periods. They are carried out within 19 measures, which include more than 50 compulsory and elective claims. In the new period, the organic farming scheme is carried out as a separate measure. Due to the differences in the types and number of measures, the area of agricultural land included in agri-environmental measures in 2015 is not directly comparable with the previous years. The area included in the agri-environmental scheme has increased significantly since 1999. In 1999, these measures were implemented on 2,948 ha, in 2004 on 235,254 ha and on 328,364 ha in 2007, which was the first year of the 2007–2013 period. In 2014, the area under the agri-environmental scheme amounted to 254,772 ha. The reduction of the area when compared to 2007 is largely a consequence of gradual termination of five-year commitments that had been taken on in the preceding programming period and restrictions in assuming new commitments after 2008. In 2015, agri-environmental measures were implemented on 317,458 ha of agricultural land (gross area). 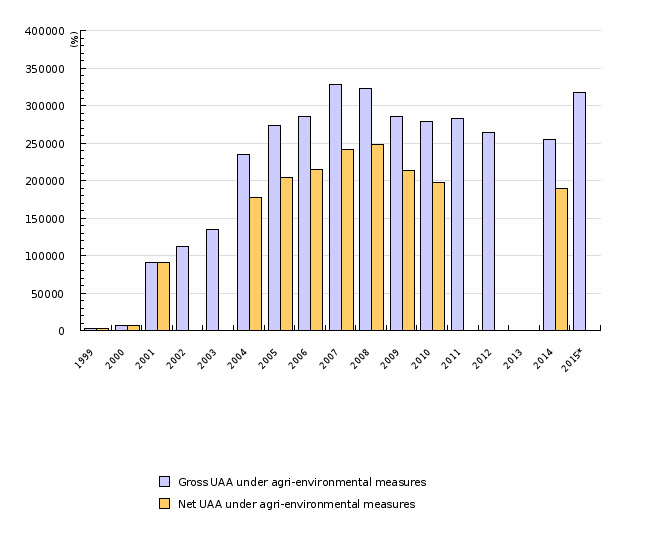 The percentage of utilised agricultural land on which at least one agri-environmental measure was being implemented (net area) increased from 0.6% in 1999 to 39.2% in 2014. Comparison with data for other EU Member States shows that the percentage of agricultural land under agri-environmental measures is relatively high in Slovenia. However, it is much lower than in e.g. Finland, Luxembourg and Austria, where it exceeded 80% in 1994.